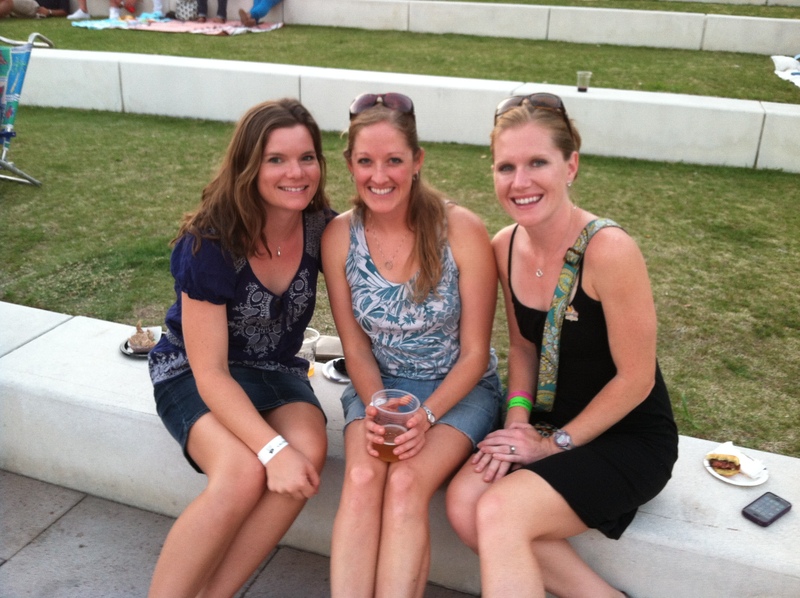 This weekend was probably the best one I’ve had in Tampa since I’ve moved here! My weekend was full of food, friends, and fun! 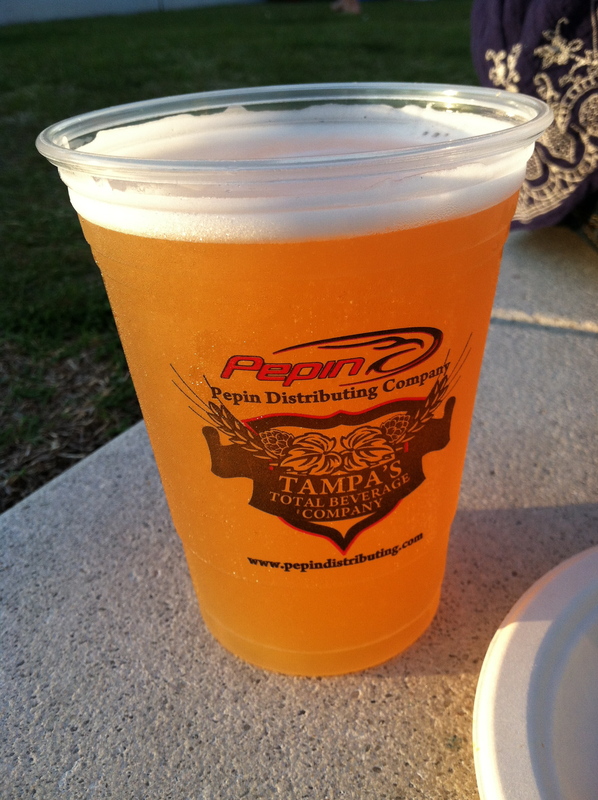 Last week, one of my friends from Running Club texted to ask if I wanted to go to the Burger Showdown on Friday night at the Curtis Hixon Waterfront Park. The name alone sounded pretty awesome, but after learning that a $35 ticket got me unlimited samples of the 12 different burgers competing, two drinks, and dessert, I was in! From the minute I purchased my ticket, I started counting down until Friday night! I knew Courtney loves food as much as I do, so I invited her to come along too. We went for a short bike ride on Friday right after work to build up a little bit of an appetite and then headed over to the park. 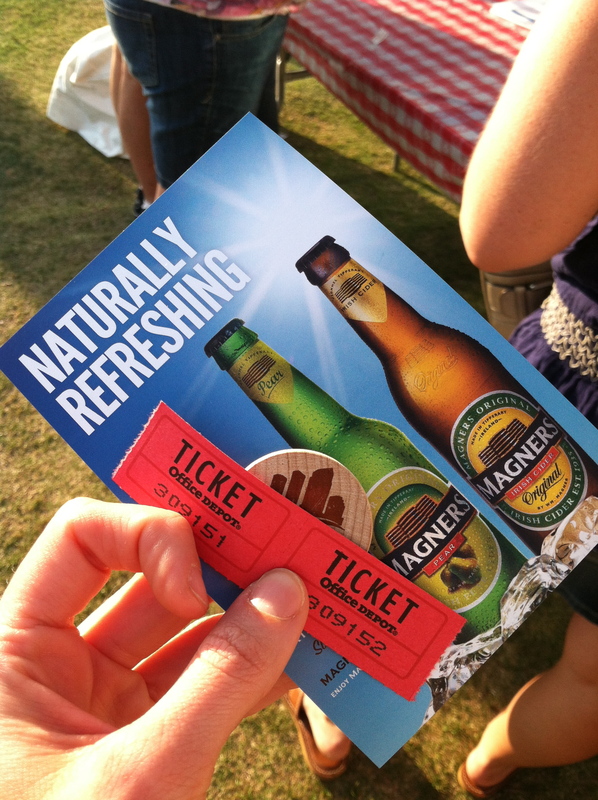 We checked in, getting our two drink tickets, a chip to vote for our favorite burger, and a postcard advertising Magners Cider. 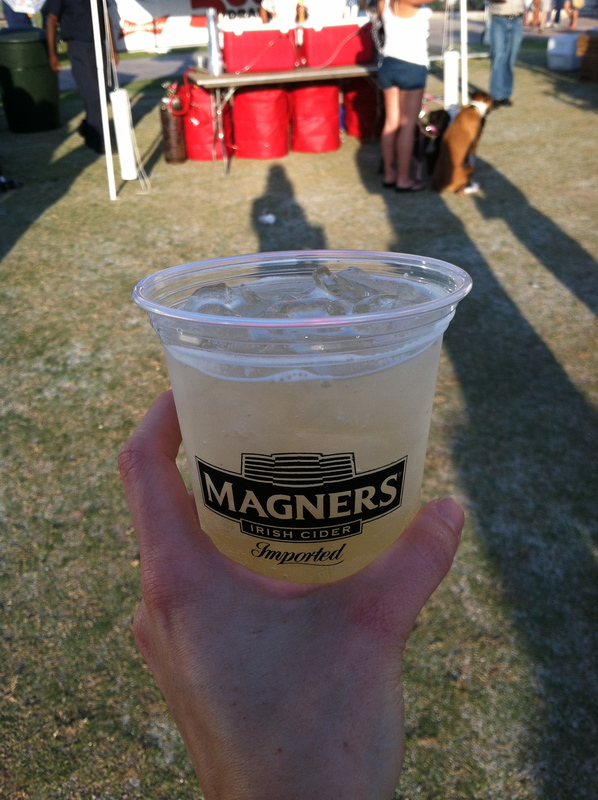 They told us to take it to the Magners tent and we’d get a free cider there. Score! We didn’t waste any time and quickly cashed in on our free cider. I got the pear, and it was tasty. Really light, sweet and refreshing. A great summer drink! Drink in hand, we headed to try our first burger. 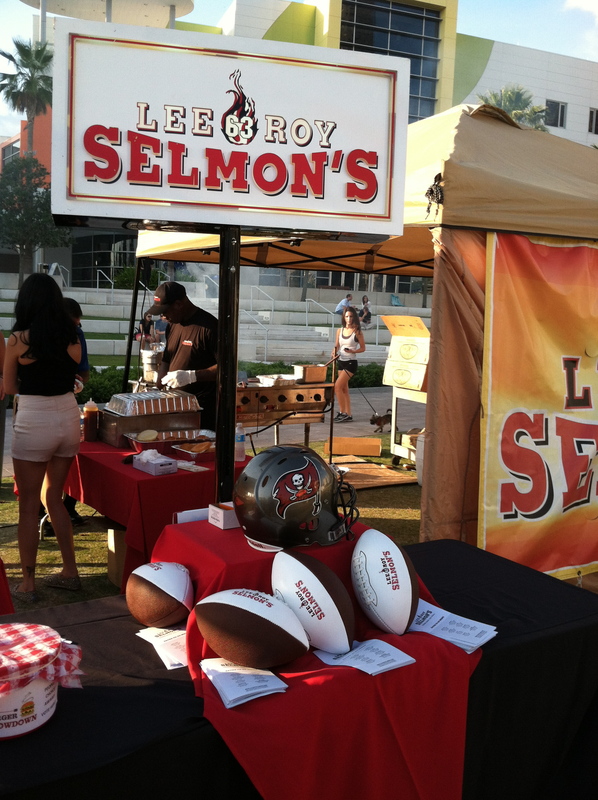 First stop: Lee Roy Selmon’s. 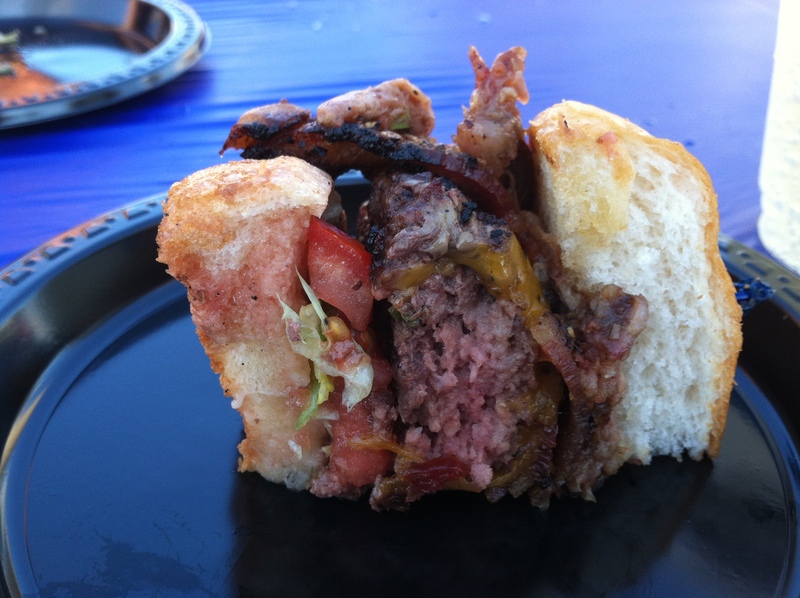 We nicknamed their burger heart attack on a bun. 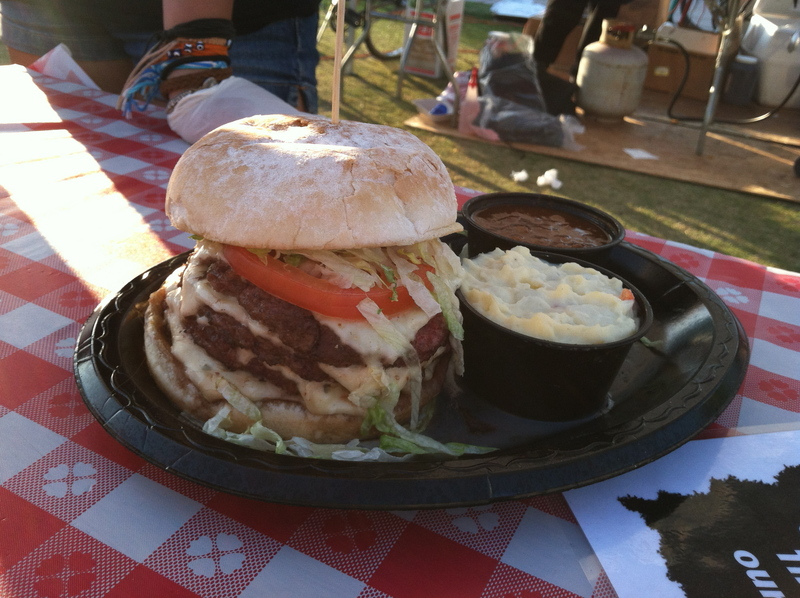 I think this was called Dewey’s Stacked burger and it was topped with pulled pork and bacon. LOTS OF MEAT. Next we moved on to The Burger Joint. I was actually really surprised to see BGR on the line up. I knew there were a few in the DC area, but I didn’t realize they were in FL too. I always wanted to go when I was in DC, but never did, so I was really excited to be able to finally try their burger! It was super rich, but SOOOOOOOOO good. I don’t know how they cooked the mushrooms, but I could have just eaten them and had a huge smile on my face! I’m not a big deli person, so I figured it was nothing special. Until I saw Meghann’s post about it a few weeks ago. OMG. Datz just shot to the top of my list of places to go for brunch. Red Velvet Pancakes?? Definitely NOT what I was expecting based on the name and looks of the building! 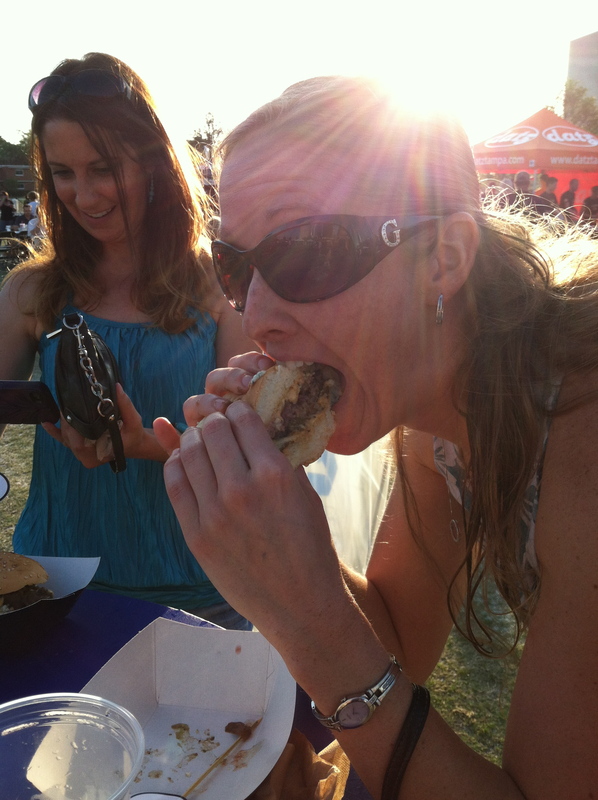 Back to burgers- Datz was sampling their macaroni and cheese filled burgers. Yes, I said the burger had macaroni and cheese inside! What a quircky combination! It was good, but I didn’t like it as much as the BGR burger. I didn’t really taste much of the mac n cheese; it was overpowered by the the barbeque sauce on top. Where to go next? We stopped by Stacked, whose signature stacked burger is a challenge to eat. If you can eat all of that (4 patties!!!) in a certain amount of time, its free. That sounds like a stomach ache waiting to happen. Their burgers weren’t ready when we went by, so we wandered to the next table. 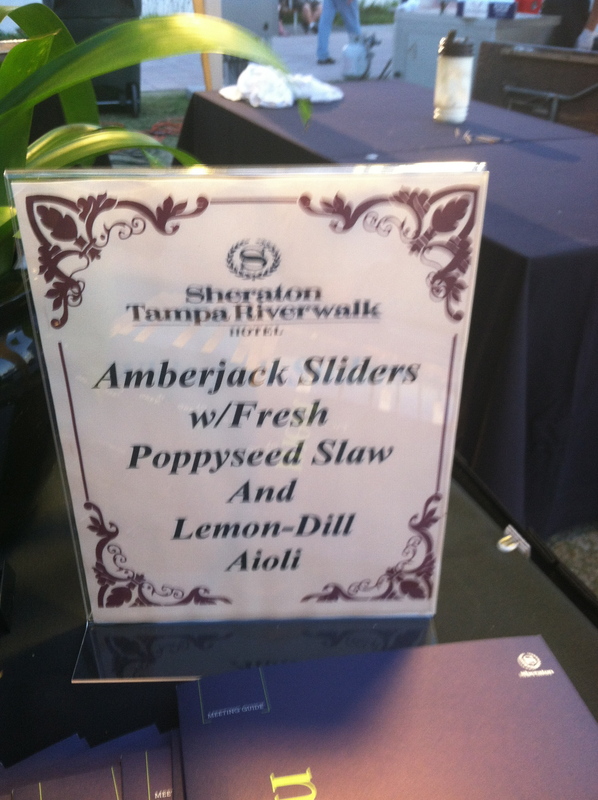 The Tampa Convention Center was sampling a new burger they are going to start selling at their outdoor cafe. I believe they called this the surf and turf, and it was a burger with lobster salad on top. There was also guacamole and I think remoulade sauce too. Interestingly, it was served on an English muffin. This one was only okay. I think it was an interesting combination of flavors, but would have been better if it had been served hot off the grill. Oh well, I guess we got to the table at the wrong time! Next up, we went over to the Ashley Street Grill. This is a restaurant in the Sheraton hotel in Tampa. They interpreted “burger” a little more loosely than the 11 other restaurants and were serving a fish sandwich. At this point in the evening, we were all getting full, but we decided to switch it up and get something sweet. We headed to the dessert table, where we had the option of an apple tart or tiramisu. 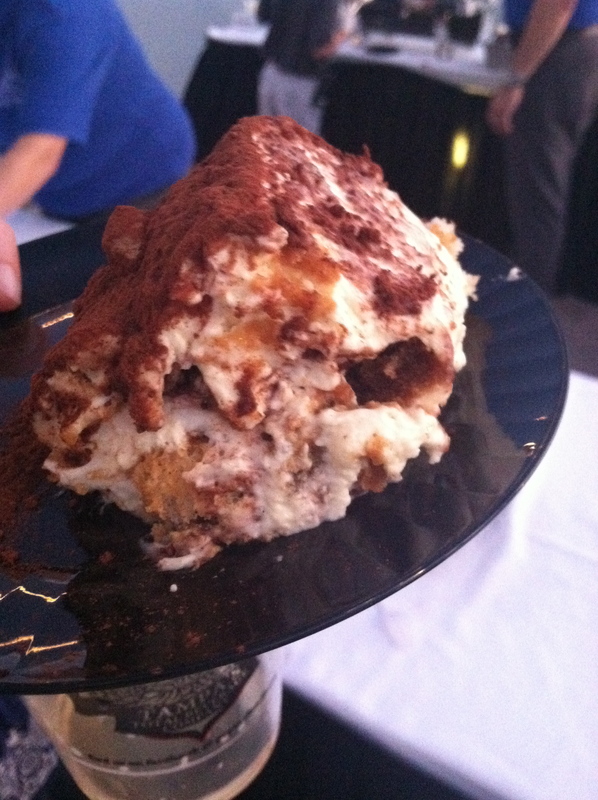 I got the tiramisu, and it was awesome! So maybe not the most appetizing picture, but it was delicious! After dessert we sat and chatted for a little before deciding to rally and go for another burger. We were planning on stopping at Burger 21, but I got sidetracked by the “Farm to Table” sign I saw at the Marriott’s tent. 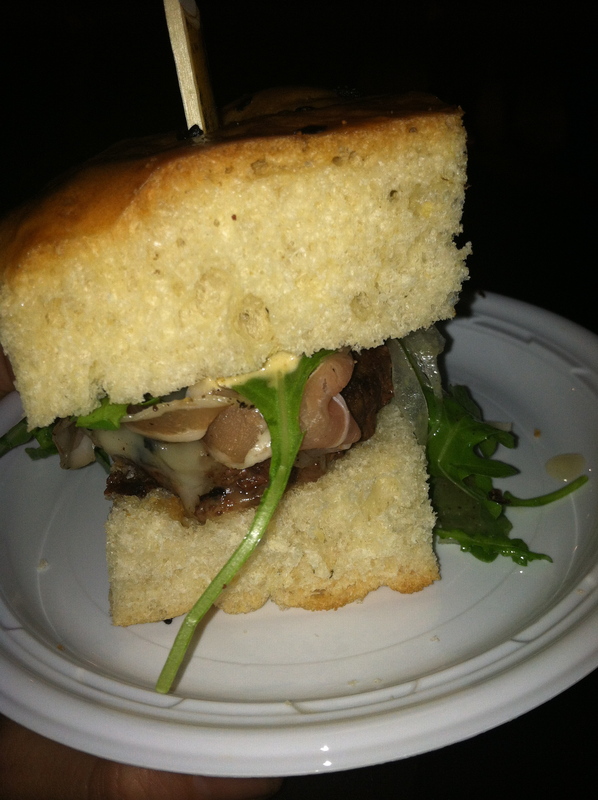 Locally and humanely raised beef, prosciutto, heirloom tomatoes, and arugula? YES PLEASE! 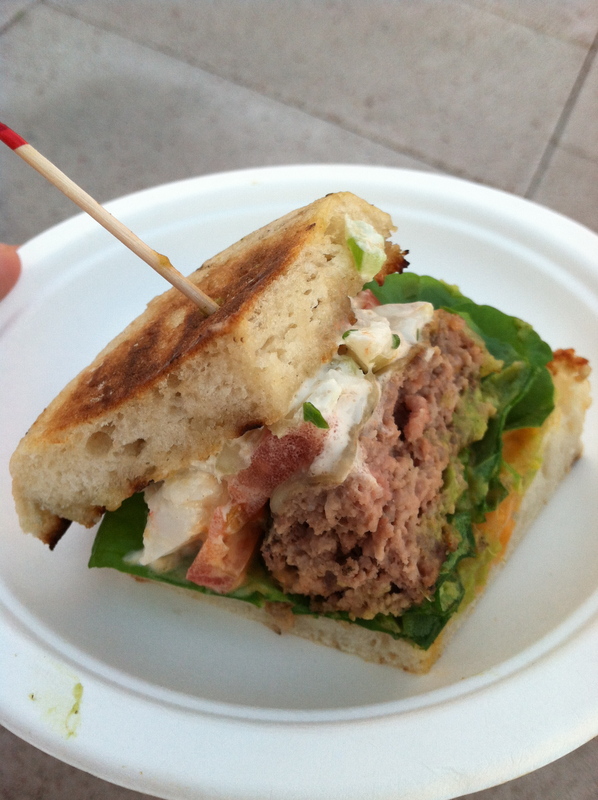 A little too much bread on my piece, but this was probably my favorite burger of the night. Even as full as I was, I still enjoyed this burger tremendously. 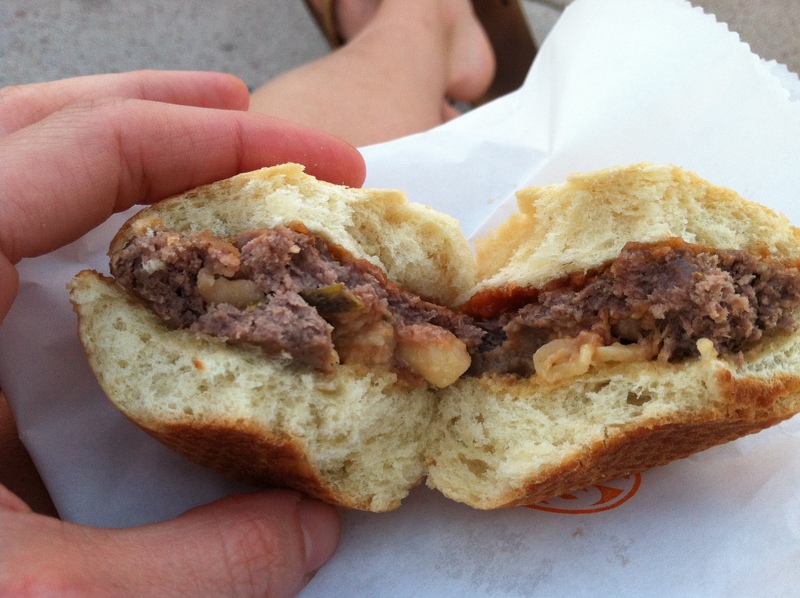 I definitely thought that the beef in the burger had the best flavor of any of the burgers I had tried. It may have just been in my head, but I’m going to go with it. 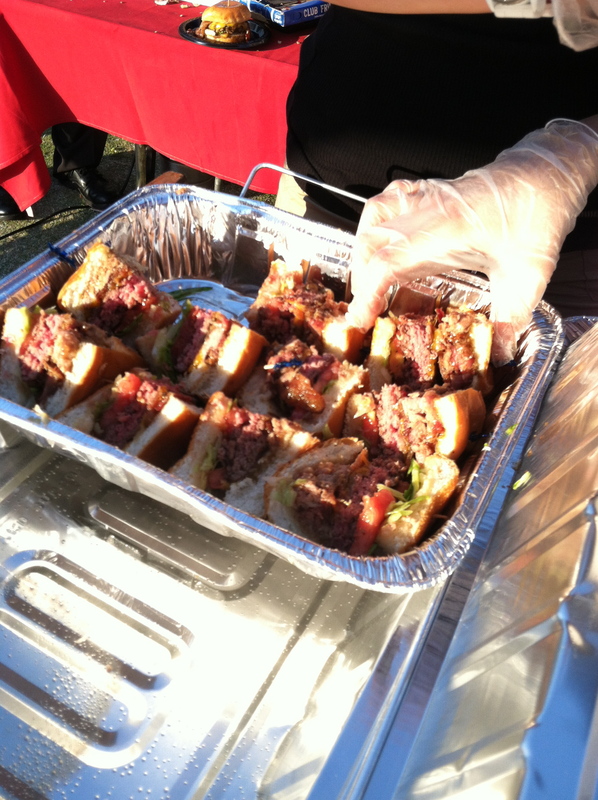 Grass-fed beef wins in my book. Unfortunately, I surrendered after this burger. 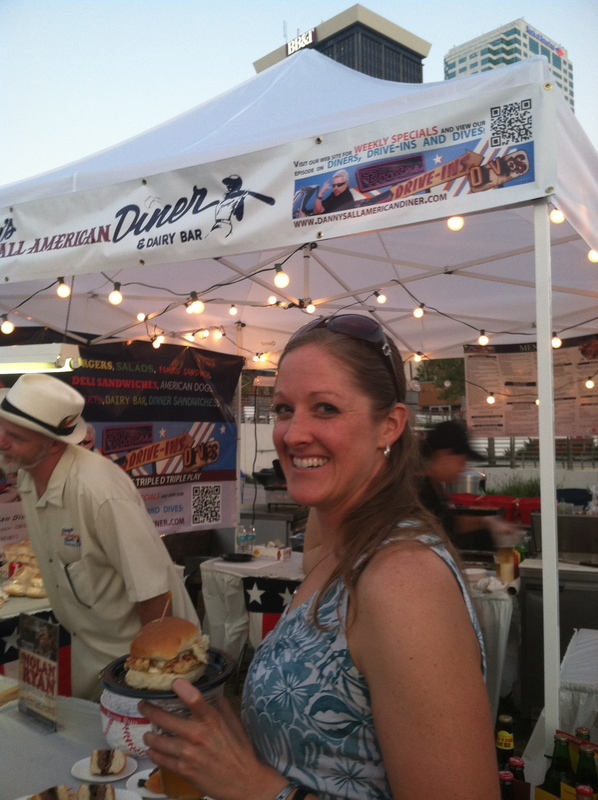 There were a few other burgers that I didn’t get to try, including one from a Danny’s All America Diner, a local joint that had been featured on Diners, Drive Ins, and Dives. I guess I’ll just have to go there myself! A few other Tampa favorites: Burger 21, Square 1 Burgers, and the Green Iguana, didn’t make it into my belly on Friday night. These have been added to my list of restaurants to try. As the Showdown came to a close, they announced the winners. One winner was The Green Iguana, which unfortunately I didn’t try! And then, I was quite surprised when they announced The Ashley Grill burger as one of the winners! That was my least favorite! 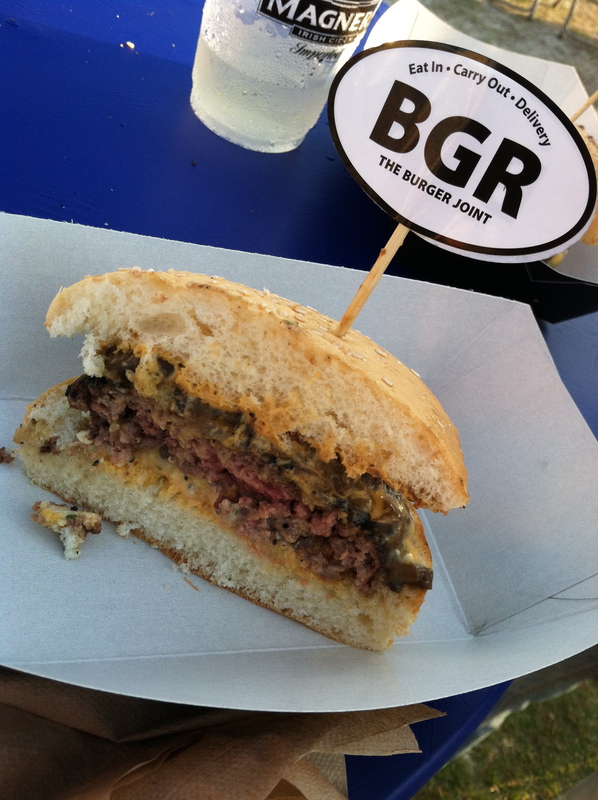 I was pleased however, when they announced the people’s choice as BGR. It was definitely a good burger. 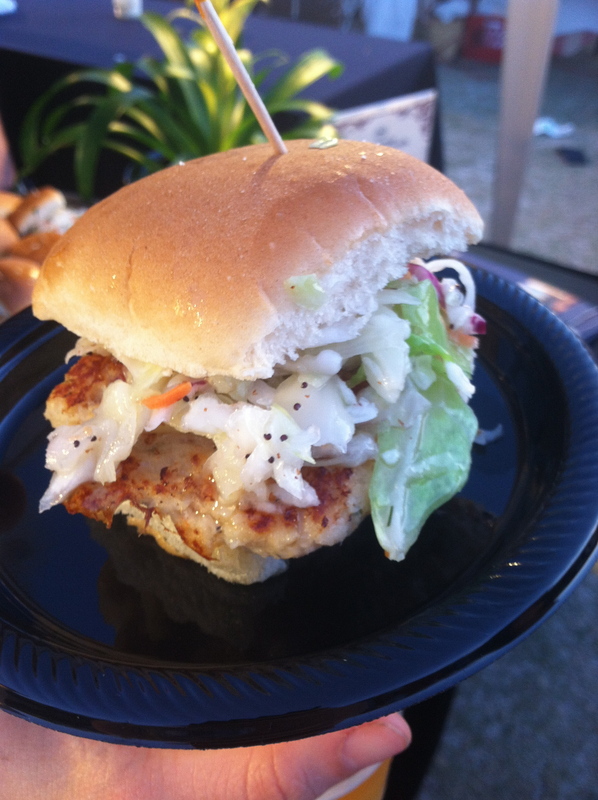 Question of the day: Have you ever gone to a foodie event like this before? How did you pace yourself?? 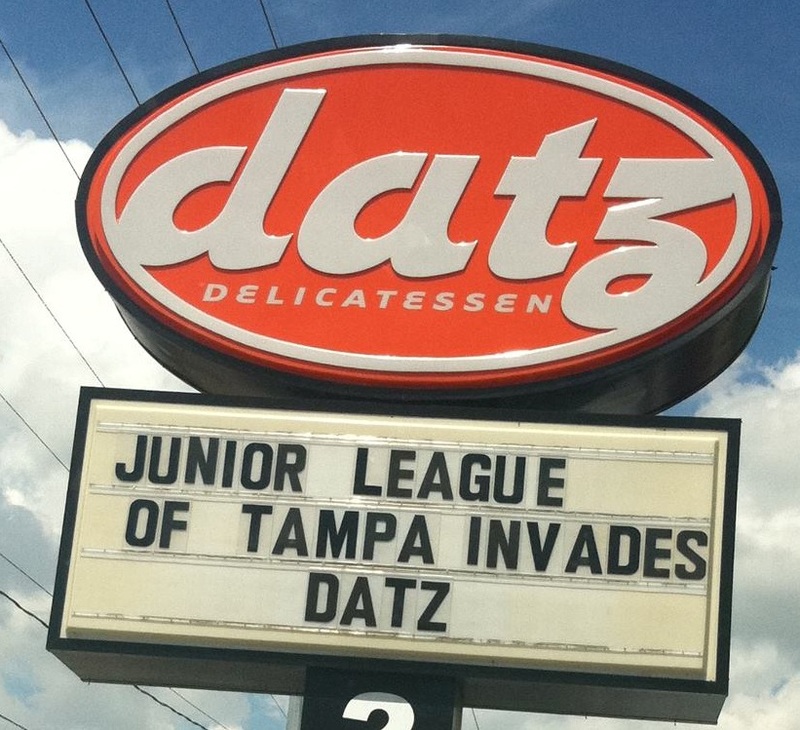 Datz is definitely my all time favorite place to go to breakfast! We have to meet up and go in the next few weeks. Maybe an easy morning run and then off to stuff our faces?! Are you down!? What a fun event! I saw this on Yelp and debated going but ended up having other plans. Thanks for sharing your pictures. I got to enjoy the even through your eyes! I live in the Westchase area so Burger21 is somewhere I go often 🙂 and it never disappoints! You got to enjoy without the calories:-) That’s awesome! Hope to meet up sometime! I’m so coming with you guys next time! Blueberry picking again soon? Looks amazing! We had a conflict this weekend, but I hope we can go next year.